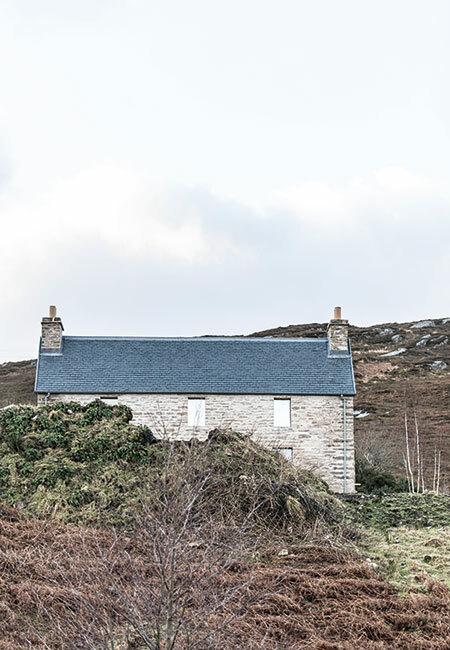 Kyle House, on the southern tip of the Kyle of Tongue in remote, beautifully stark Sutherland, was a wreck. It had been built at least a hundred years ago, almost certainly using stone from an Iron Age broch on the hill above. Those walls were all that was left; with no roof for protection, the interior had fallen away into nothing. For the owners of the estate on which it sits, these ruins raised a number of questions. Just how derelict does a building have to be before rescuing it becomes impossible? Is there value in creating something new from a building in such a neglected state? And if such a cottage is too special not to bring back to life, how do you rejuvenate it in such a way that it both speaks of the past and points to the future? Fortunately, the owners happen to be a couple of visionary Danes, Anne Storm Pedersen and Anders Holch Povlsen; several estates throughout the Highlands belong to them, and they’re in the midst of a conservation project to restore the wild landscape, planting thousands of trees and reintroducing native flower and plant species to the area. 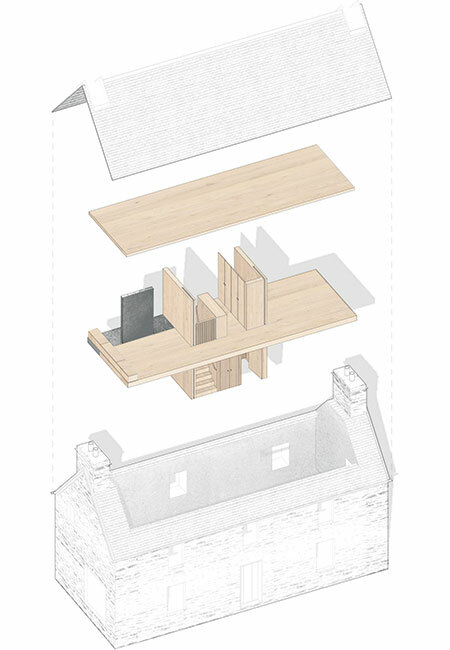 They have also, with this house, built a destination that has quietly put Scottish architecture on an international stage. They bought the estate seven years ago and already knew who they wanted to help them realise their plans to turn the cottage into a beautiful place for short holiday lets: interior designer Ruth Kramer and architect Gunnar Groves-Raines. Pedersen has collaborated several times before with the former, who has been her friend for many years. 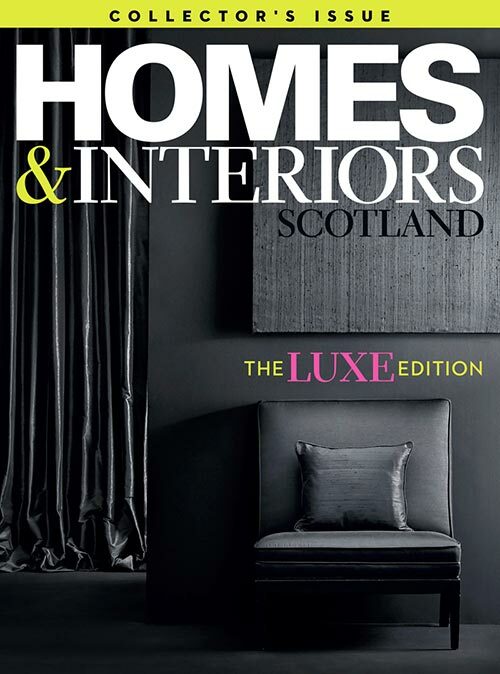 Their shared ‘Scandi-Scots’ aesthetic works in harmony with the designs of the latter, founder of Leith’s GRAS, which is part of Groves-Raines Architects. To begin with, of course, there wasn’t much of an existing building for Groves-Raines or Kramer and Pedersen to work with; almost nothing remained of the original interior. They and the owners, however, were united in their vision for the building; all four wanted to create something very simple and understated that would find its natural place in the landscape and wouldn’t look like a new addition. The first sketches were drawn up towards the end of 2015 and the contractor Ewen MacRae was initially expected to finish by the summer of 2017. But it wasn’t until almost a year later that the house was ready for its first guests. Although the delay was frustrating, Groves-Raines believes the time taken was necessary because of the specialist nature of the work being undertaken. “Rather than dictating a specific design outcome, many of the suppliers were informed of the project parameters and design intent, and were invited to engage and contribute to the creative process,” he explains. 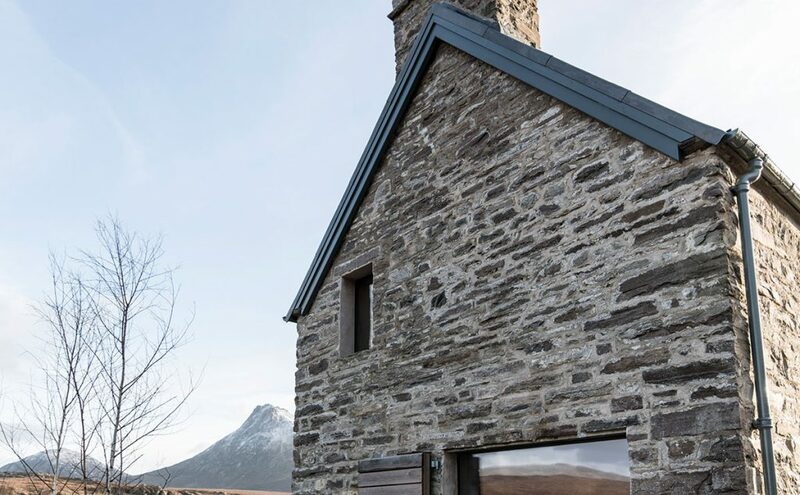 The outer walls were faithfully restored using reclaimed stone, while the roof was reinstated by matching the original slate to local samples. Stone salvaged from other derelict properties within the grounds of the estate was used to make sills and lintels. The outer shell of stone and lime plaster (bespoke mixes were developed and tested by polished plaster experts Viero in Hertfordshire) reflects how this symmetrical two-storey building would have been created originally. What has changed is the amount of glazing the house now has. “We felt it was necessary to form new, large-scale windows to allow light in and to create expansive, framed views of the landscape,” says the architect. 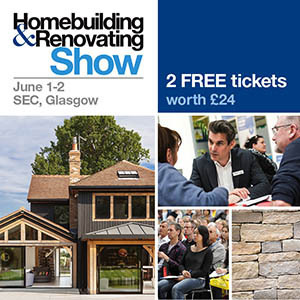 Triple-glazed windows by James Meghay at Mitchell Glass have been inserted on both gables, as well as the rear elevation, giving views east to Ben Loyal, north towards the Kyle of Tongue and west to the remains of Dun Mhaigh broch. 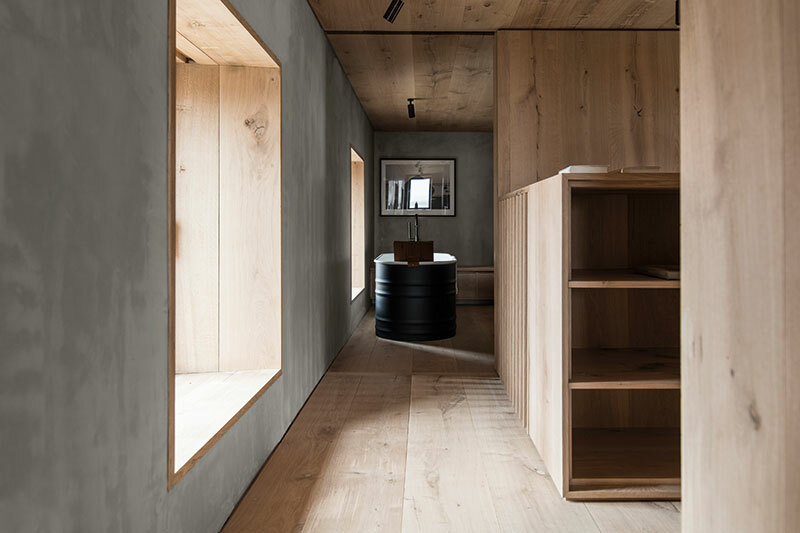 Inside, he has designed a series of wooden boxes that connect to give a sense of flow from one area to the next, with the functions of the house – eating, sleeping, living and bathing – all apportioned equal space. The ground floor houses the kitchen and living area, with the bedroom and bathroom upstairs. Locally quarried Caithness stone slabs, supplied, polished and installed by Stone Source Ltd, have been laid throughout the lower storey. 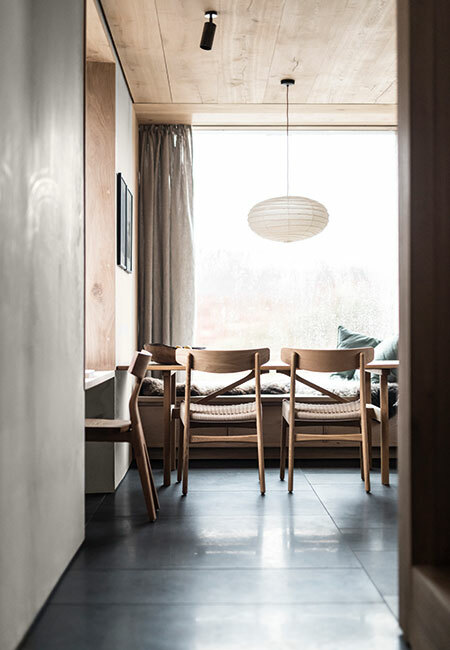 Oak-lined window seats, the timber supplied by Danish manufacturer Dinesen, draw you towards the harsh and unforgiving landscape beyond the glass. 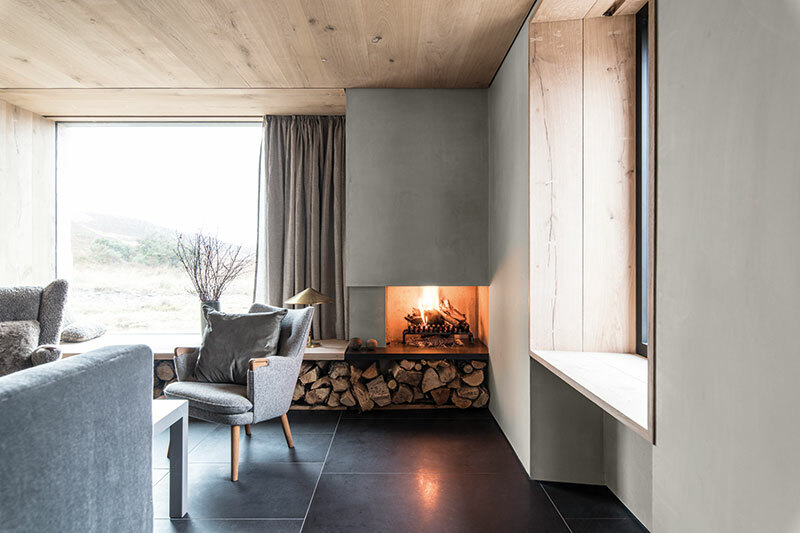 He describes the house as ‘monastic’ and ‘humble’, referring to the economy with which every element has been conceived; this, though, perhaps doesn’t do justice to the simple beauty and understated quality of the interior finishes. 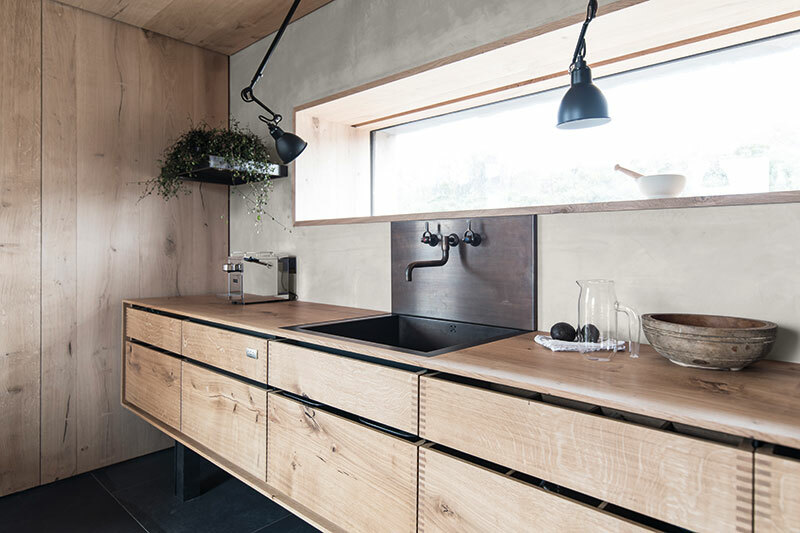 The freestanding kitchen, designed by Garde Hvalsøe in Denmark and made by hand, uses the same Dinesen oak as the rest of the cottage’s scheme. 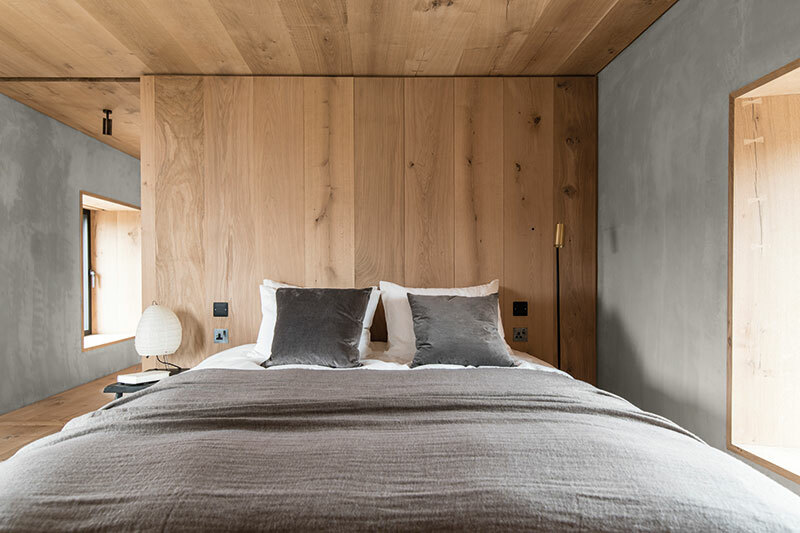 The timber gives the interior warmth and connects it to its surrounding environment without obvious props or accessories. “Only the most necessary objects are placed in each space, and the detail and finish of every piece has been painstakingly considered, reduced to its essential form and all constructed from a simple materials palette of stone, timber, metal and glass,” says the architect. A long, letterbox window has been inserted in the wall above the kitchen sink to act both as an eye-level view of the outdoors and as a framed, ever-changing panorama that removes the need for any art on the walls. 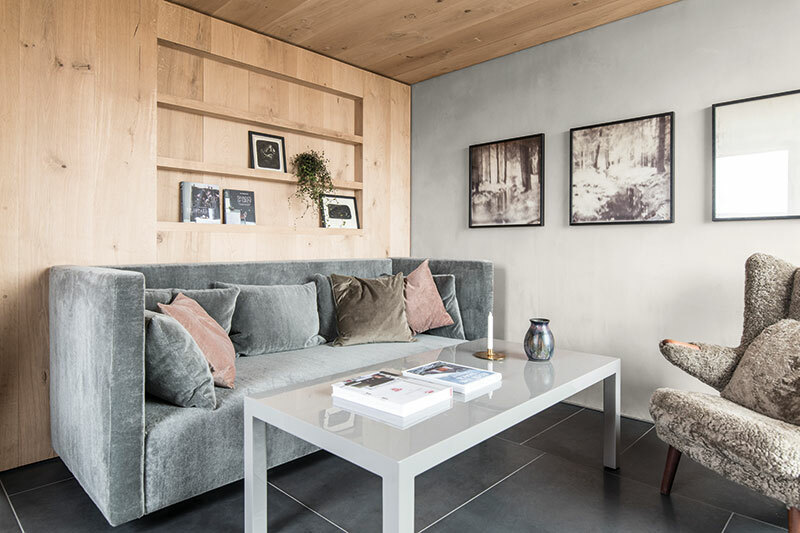 Ruth Kramer and her client have resisted the urge to over-dress the space, instead choosing minimal pieces that conform to their Scandi-Scots style and complement the craftsmanship that has gone into the structure itself. It means colour is muted and soft, and furniture and textiles are tactile and will take on character as they age and wear. The bathroom is a generous space – as big as any other room at Kyle House – since the design team were united in their belief that bathing has a ritualistic, restorative function that guests should be free to indulge in. The freestanding bathtub, by Italian supplier Agape, has been positioned next to the window so that gazing out to the landscape can become part of the bathing experience. 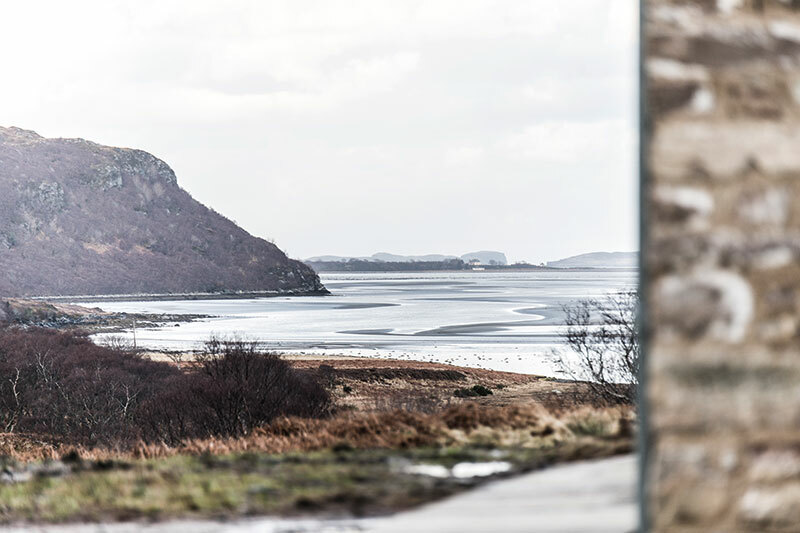 The rainfall shower has a moody ambience but it too enjoys a view out to the hills. There is only one bedroom, but it, like the rest of the house, is a skilful blend of form and function. The bed itself was made to measure to fit the space, and only another couple of pieces of furniture occupy the room; its designers’ intention is that the wild land outside should seep in, and that it should feel as if there is no obvious separation between indoors and out.